GRETCHEN'S WOOD AND OTHER LOVECRAFTIAN TALES OF TERROR IN COLUMBIANA COUNTY, OHIO, by Ran Cartwright. PublishAmerica, 2005. 198 pages. $19.95 ISBN 1413769713. 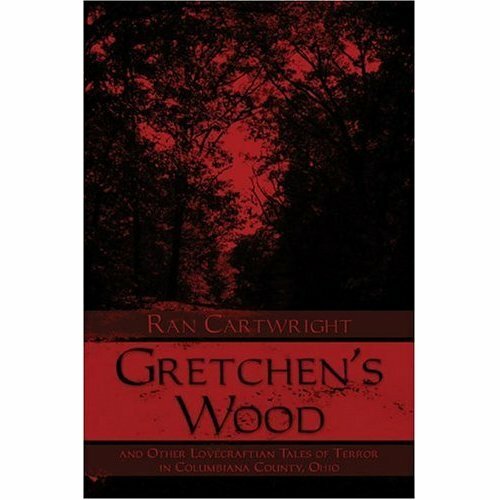 Gretchen's Wood by Ran Cartwright is a collection of mythos stories set in Columbiana County in northeast Ohio. The publisher is publishamerica, with a website at . For the life of me I could not figure the company out, although admittedly I only spent a half hour browsing their website. They solemnly proclaim that they are not a vanity press or POD for authors' to finance their own printing but I remain suspicious. With no firsthand knowledge (so this has to be gospel . . .), I've heard they publish books unedited and unmarketed, granting the fledging author an ISBN number and printing their book. The company gets their money as a cut of the book's sales. The cost for Gretchen's Wood was pretty steep at $19.95, eligible for free shipping from Amazon; it was only $16.95 directly from the publisher but I think there are shipping costs involved. Shocklines does not carry it. The book is a standard trade soft cover with 198 pages, with stories actually beginning on page 13. The cover is an atmospheric red and black photo of some woods, what I guess are in fact the real Gretchen's Wood. I would call it nondescript, neither detracting nor enhancing the book. There are eleven stories here. Either they are newly published or else they have been extensively revised for this book, as is explained in the useful author's introduction. Production qualities seem standard. I do not think the book was edited by anyone. There are a fair number of minor typos, more than I am used to seeing in such a book, but nothing severely egregious like The H.P. Lovecraft Institute. The only thing I ever read before by Ran Cartwright was his story about Azathoth in issue # 1 of Dreaming in R'lyeh (I've still got James Ambuehl's copy!). It did not move me at all when I read it a year ago and I only found out about it again as the magazine was mentioned in the brief bio on the backcover (albeit as Dreaming of R'lyeh). I went back to it today to confirm my impressions after slogging through this book. The latest story by Mr. Cartwright to see the light of print was in Lost Worlds of Space and Time Volume Two. Unfortunately, I didn't like that one either. I really don't get these books with the intent of panning them. I want to like the mythos stories I read. Alas sometimes it does not happen. I guess a tip off about what you are getting into is the fact that four stories use the word horror in the title, a direct nod to HPL's "The Dunwich Horror." All the old mythos tropes are trotted out here: people don't laugh, they cackle. In the first several stories whippoorwills are prominently mentioned. Shrill piping echoes everywhere. Everyone and their brother seem familiar with mythosian books and entities. Just about every tale features a chanted Iä Iä. (To prospective authors I just say get your Iä Iäs out!). Well, I suppose that's OK; I think most fledgling mythos authors start out with heavily tributary stories before branching off on their own paths. The biggest difficulty I had was that I was not impressed with the prose. Read a story here, then pull out Horrors Beyond and reread "One Way Conversation." The differences are stark. In Gretchen's Wood the characters are paper thin, indistinctive and ultimately forgettable. Their motivations and actions were contrived or incomprehensible. Frankly I don't think giving them surnames, or in some cases middle names, was necessary. It sure didn't enliven the stories. Not much here ventured off very standard mythos plotting. I really only liked three things about this collection. First, the rich detail about Columbiana County added much needed depth to the book. Obviously Mr. Cartwright knows this area well. Second, the best part of each story was generally the action sequence near the end. The build up in general was arduous and uninvolving. In fact "Black Horror of Dungannon" was a bit of a disorganized mess, but the final shoggoth attack was carried off with panache. Third, in my opinion the best story was reasonably good, "Dreaming in Darkness." So I can't really recommend this book. I kept setting it aside and only managed it in drips and drabs. I can think of some fans who would like it: those readers who are new to the mythos and still have a very strong preference for conventional knockoffs that don't cover new territory and don't stray from the usual plot tricks. You know most of us were at that point at one time or another. Those of you who will get a book for one good story might do so for "Dreaming in Darkness." And some fanatics need to buy everything, which is, I guess, why I got it. THE TALES OF INSPECTOR LEGRASSE, by H.P. Lovecraft and C.L. Henderson. Cover by John Fogletto. Poplar Bluff, MO: Mythos Books, 2005. 217 pages. $20.00 ISBN 0-9728545-1-7. Cover illustration © John Fogletto. The Tales of Inspector Legrasse by C.J. Henderson is a 2005 title by Mythos Books. As usual Mythos Books advertising is pitiful, as I just sort of stumbled across it. And don't get me started about their website. It is a very nice quality trade paperback. At Amazon it is $13.60, eligible for free shipping if you buy $25 worth of books, although with slower delivery. The cover has a handsome noir type painting of Legrasse with a superimposed femme fatale looking type. It is by Ben Fogletto, who was, I think, the artist for Mr. Henderson's occult detectives book. There is an even more noirish sketch of a world weary Legrasse on the frontispiece by Erica Henderson. Alas there is no other interior art by her, which would have been very welcome. Page count is a generous 217. In the back are advertisements for a number of books, including the forthcoming The Black Sutra by DeBill (big yawn factor on the cover art) and Unholy Dimensions by Jeffrey Thomas (pretty cool looking cover). 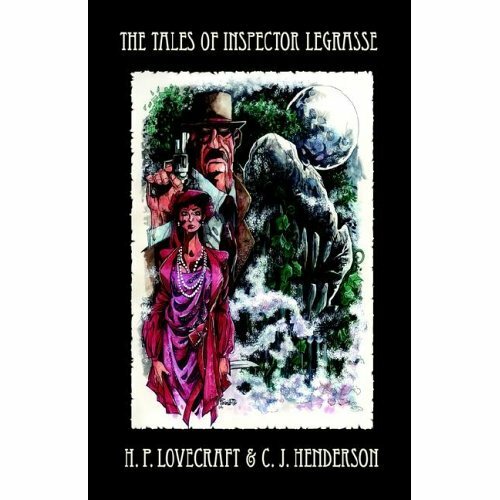 The book's contents consist of HPL's "The Call of Cthulhu," the classic which, of course, introduced us to John Raymond Legrasse, and six additional stories by Mr. Henderson, who brings Inspector Legrasse to life for us. All stories are listed as copyright 2005, which evinces some sloppiness on the part of Mythos Books. For example, "To Cast Out Fear" appeared in Eldritch Blue from 2004 and "Patiently Waiting" was in The Occult Detectives of C.J. Henderson from 2003. I do not know if the rest of these stories already saw print elsewhere somewhen. The introduction is by Bob Price, and is only mildly annoying. Of course Mr. Henderson's mythos credentials are impressive and I have certainly read numerous stories of his. Although it is unwise to peg an author, it is safe to say that noir type supernatural detectives are a favored genre of the author, as evidenced by his Teddy London series, his occult detectives book and his Anton Zarnak stories. With such highly honed skills, Henderson's stories almost always deliver the goods. The premise of this book is to flesh out Inspector Legrasse as a character. This is fertile ground for a mythos author. After all, what did HPL provide to us beyond a name? He gave us a sketchy first adventure but HPL just wasn't an action writer or a character writer. He gives us a brief glimpse of the horror in the swamp. The situation was just begging for someone to fill in the gaps. Thankfully, the talented C.J. Henderson picked up the challenge. All of these stories (except, perhaps, the last, "Nothing to Fear but Dust", which benefits from knowing the series background) may be read independently. I am presuming, given the problematic copyright listing, that they were written over a number of years and appeared here and there before being compiled for this collection. Where was I . . .? OK, there is an overall arc to the story collection leading up to Legrasse's ultimate confrontation with the Cthulhu cult. Characters introduced in one story will show up in subsequent ones. As Legrasse struggles to make sense of what happened in his first Cthulhoid encounter he becomes more and more detached from the normal course of human affairs. He is a somewhat tragic figure, setting himself to fight monstrous evil, but completely out of the public view, unknown and disregarded by the people he is saving. It takes all of his reserves of character to maintain his equilibrium as he finds out more and more about Cthulhu, the Great Old Ones and mankind's place in the universe. But he perseveres, knowing in his heart that humanity is worth preserving, that people of good will must set themselves against this horror at whatever cost, even if it only delays the inevitable. Along the way he makes friends with Anton Zarnak and develops a small circle of devoted followers. All stories are highly crafted and enjoyable in a way different from HPL's magnificent "The Call of Cthulhu." HPL provides the cosmic sweep and Henderson the human dimension. Approach this book in the spirit of the noir types detective stories of the 20s and 30s and you will be very satisfied. Don't look too hard at how a few men can mow down a charging mob of Deep Ones with handguns, or at how sketchy the secondary characters are, or how untrained men, including the elderly, the out of condition and the morbidly obese, can navigate across the terrain of the Himalayas. Such quibbles will only spoil your enjoyment and are beside the point anyway. So, in summary, The Tales of Inspector Legrasse is a fine book, practically self recommending. It will offer many enjoyable hours of reading to any mythos fan. Based on this, my next book will be The Occult Detective of C.J. Henderson. UNHOLY DIMENSIONS, by Jeffrey Thomas. Cover by Jamie Oberschlake. Poplar Bluff, MO: Mythos Books, 2005. 267 pages. $20.00 ISBN 0-9728545-2-5. Cover illustration © Jamie Oberschlake. 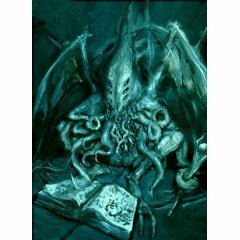 The enterprising small press Mythos Books has finally been releasing some titles that we have all been waiting on for some time (And some we had no idea were pending release; their website is extremely user unfriendly compared to Elder Signs Press, Hippocampus Press or Golden Gryphon Press. On the other hand Wildside Press and Pagan Publishing won't win any prizes for keeping up to date either . . .), like The Taint of Lovecraft and The Tales of Inspector LeGrasse. Coming soon is a highly anticipated collection by Walter DeBill, The Black Sutra. I feel like I was waiting on Unholy Dimensions for more than a year. Jeffrey Thomas is a highly respected horror and science fiction author who certainly needs no introduction from me (all us reviewers write this before we introduce someone who needs no introduction . . .). He is the creator of Punktown, a wild, weird and wonderful city on the alien planet of Oasis. Originally named Paxton, it has been renamed Punktown by its inhabitants, a mixture of humans living side by side with other almost human races, and other completely inhuman species. Full of crime, drugs, desperation, poverty and intrigue, Punktown is a violent place. So far the Punktown saga may be read in Thomas's collection Punktown, the collection he edited, Punktown: Third Eye (guest authors set stories in Thomas' world), Thomas' novel Monstrocity (which is an entirely mythosian outing; Punktown's human-like races have their own traditions of grimoires, and names for the mythos entities and the Elder Gods), and a new collection by Jeffrey Thomas and his brother Scott, Punktown: Shades of Grey. This last is the best and edgiest Punktown collection so far! Although Thomas is best known for the Punktown series, HPL's mythos was influential for him and he has often applied his highly polished gifts to mythos stories. The bulk of these are now assembled in this trade paperback from Mythos Books. All of these titles have seen the light of print before, except "The Young of the Old Ones" and "What Washes Ashore," newly written for this book. However, most of these were in periodicals like Deathrealms, Cthulhu Codex and Midnight Shambler, so only an assiduous mythos collector like James Ambuehl would already have them. In fact, as I mostly collect books, I only had "The Cellar Gods" from 1999's New Mythos Legends. Some housekeeping: This is a trade paperback with 267 pages. It's all fiction; no author's notes or introductions. 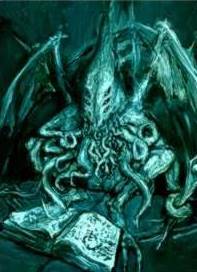 The cover is by Jamie Oberschlake, and it is highly effective, showing a Cthulhu-like entity crouched over an ancient tome. There is more interior art by Peter Worthy that didn't do too much for me. The price is $20 list but it is heavily discounted to $13.60 by Amazon, and available for free supersaver shipping although at a downgraded rate. Thomas continues the Lovecraft Circle tradition of mentioning other mythos authors he likes in some of his stories. For example, one of the cultist victims in "The Bones of the Old Ones" is Willy Pugmire, some action in "The Avatars of the Old Ones" takes place in the Ambuehl Building and a note from S. Sargent appears in "Corpse Candles." Thomas also pays homage directly to W. Pugmire by setting a story, "Through Obscure Glass," in Pugmire's Sesqua Valley. This was a daring story, I think, because no one can really write with Pugmire's sensuous prose or make the visceral Sesqua Valley come alive like he can. The trilogy of stories that opens the books is set in the Punktown universe; "The Bones of the Old Ones" actually takes place in Punktown. HPL names like Ward and Poe names like Pym appear in some stories. Much of Thomas' approach to the mythos (or Yog-Sothothery if you prefer) is very conventional, the Great Old Ones were cast into imprisonment by the Elder Gods. The Elder Sign has unusual potency against them and their servitors. The grimoires are the usual suspects, except for Thomas' own The Book of Awe and The Metal Book. My summary is that I highly recommend this collection. I think, however, that the stories written later, like "What Washes Ashore" are more deftly written than the earlier ones (well, our favorite authors are always honing their craft, aren't they?). Also I tended to like those stores more tangentially mythos, like "What Washes Ashore," more than the more conventional Old Ones trilogy. The poetry, "The Ice Ship" and "Ascending to Hell," and the comic relief, the poem "YooHoo, Cthulhu" and the story "The Doom in the Room," were all low points for me. Others might like them more. Unfairly perhaps, similarly to G.W. Thomas' Book of the Black Sun, I thought the sum was more than the parts. I was engaged all the while, but saw no flashes of brilliance. The best mythos stories sparkle, like the dazzling "Annandale's Final Draft" in Dead But Dreaming; they match the best that horror, fantasy or science fiction of any stripe has to offer. For what it's worth, while I think the bulk of these stories are well crafted at a high level, none of them really stopped me in my tracks. When I read "One Way Conversation" by Sammons in Horrors Beyond I had to pause to catch my breath and immediately reread it. Not so with Unholy Dimensions, although mostly the stories are very good reads and a few were quite fine. I'll briefly comment on some of the stories; mild to moderate spoilers may follow, so don't read further if that bothers you. "The Bones Of The Old Ones," "The Avatars Of The Old Ones," "The Young Of The Old Ones" -- These 3 stories, set in the Punktown universe, are the most Derlethian tales. 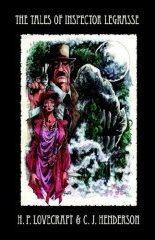 Similar to Derleth's heroes, an unwilling detective John Bell is forced to accept that mythosian entities lurk beyond the veil and he has to sacrifice himself to oppose them. These were good straight up mythos stories. "Book Worm" -- I highly enjoyed this story, where a lover of antiquarian books and arcane mysteries sneaks into his grandmother's house to peruse an ancient volume she intends to sell as part of his late grandfather's estate. Sometimes you can really lose yourself in a book . . . "Lost Soul," even though a very different sort of story, also dealt with using a book as a portal into another dimension or reality. "Lost Soul" was also a very good read. "The House On The Plain" -- Space travelers find an old Victorian house on the plains of an inhospitable planet. Some dabbler in ancient lore managed to get himself transported here many years ago . . . In both "The Boarded Window" and "Red Glass," for some reason it is possible to get a glimpse of another dimension through the mundane surfaces of our own. Both were extremely well written. "The Servitors" -- Another excellent story! As a strange alien tries to escape its mundane and eternal existence, the human protagonist, living an isolated and alienated existence, gradually loses all touch with her humanity. The parallel tales converge very neatly. "Servile" -- The protagonist is hired as a servant for a respected archaeologist who is now disabled. It turns out the archaeologist herself is just a servant of a darker reality . . . This was OK, not my favorite but still good. "I Married A Shoggoth" -- What would you do if you could summon a shoggoth and it would obey your telepathic commands, assuming any shape and performing any action you chose? And the shoggoths did evolve intelligence of a sort . . .
"The Third Eye" -- An Arkham detective, ruined by years of drinking too much and seeing too much, bequeaths his son with a strangely shaped amulet. Good enough read, not my favorite. "Cells" -- Looking beyond the veil of existence, can you call back a recently departed soul if you have a vessel waiting for it? OK, again not one of my favorites. "Conglomerate" -– Suppose you find out the modern art in your company's foyer actually has a specific purpose, and the chief executive is really not who he says to be, but has much darker, more cosmic aims? "The Face Of Baphomet" -- What were the real secrets of the Knights Templar? Has their order really been expunged? Interesting little tale! "Pazuzu's Children" -- This was one of the best stories in the book!! It has a different take on what really happened during the first Gulf War. "The Cellar Gods" -- Another well crafted story of a man who befriends and falls in love with a lady from Leng, keeping her concealed in his cellar for many years while she manifests her true heritage. This was kind of a familiar work. I wonder if maybe I read it somewhere else some years ago. "The Writing On The Wall" -– Likeable and too brief, this is the story of an archaeologist who discovers some mysterious glyphs. It sort of reminded me of a story, I think by Lin Carter, of an Egyptologist who discovers some hieroglyphics that show the entire history of the world as well as the future. "Corpse Candles" -– A detective investigates two brothers who just might be wizards and have an age-old enmity. "What Washes Ashore" -- My absolute favorite in the collection, here I saw the full power of Thomas's writing skills. For my money, it edged out Pazuzu's Children by the barest margin, I don't know why, maybe because the imagery and prose were just spot on for the mood Thomas sought to create. You never know what you can find in an old seashell shop. "Out Of The Belly Of Sheol" -- Well, now you know what really swallowed Jonah . . .
"The Fourth Utterance" -– In a very inventive slant for a mythos story, a woman keeps getting messages on her answering machine from some poor sod who has pierced the veil of reality. The thing is, they are all wrong numbers and she's not sure what to do . . .
"Through Obscure Glass" -- If you are ever in Washington state, pay a visit to the Sesqua Valley. Plan to stay a spell . . .
Really, all mythos fans must get this book. The best stories are top notch, and the overall level of creativity and polish in the prose puts most mythos collections in the shade. Best of all, most of these have not been reproduced ad infinitum in other books. Also best is that Jeffrey Thomas is still busily creating worlds for us to explore. I'm sure this is not all his mythos output. I could swear I read a Yellow Sign story set in Punktown by him some years ago that absolutely knocked my socks off. Perhaps if this title is a big enough success for Mythos Books they could be persuaded to give us another volume! 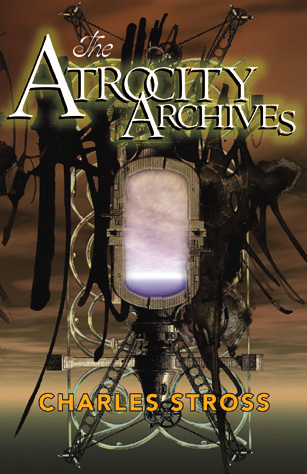 THE ATROCITY ARCHIVES, by Charles Stross. Dust Jacket by Steve Montiglio. New York: Golden Gryphon Books, 2004. 295 pages. $24.95 ISBN 1930846258. Dust jacket illustration © (unknown). New York: Ace Books, ????. 368 pages. $14.00 ISBN 0-441-01365-1. 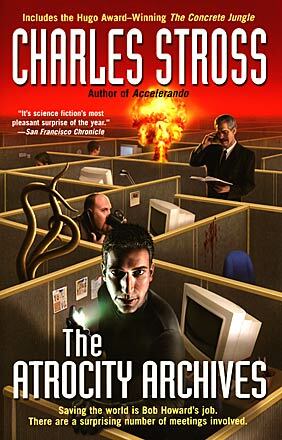 The Atrocity Archives by Charles Stross is available from Golden Gryphon Press. Cost is $24.95 with postage paid for US orders. I don't know if there are discounts available from Amazon. The book is in its second printing but last I checked GG still had some 1st editions left for those of you who care about such things. It is a beautiful hardcover; all of Golden Gryphon's books have great production qualities. I have a copy of Eternal Lovecraft and it has similar appealing features. Binding is cloth with a nice slip cover with art by Steve Montiglio. The painting depicts some arcane appearing machine creating a gate into another world, very well done and very appropriate to the subject of the book. A paperback version for $11.20 is also available at Amazon. There is an introduction by Kevin MacLeod and a detailed author's note at the end, both of which are enormously informative and as entertaining to read as the books itself. The book in fact contains a novel, "The Atrocity Archives," and a novella, "The Concrete Jungle," which carries on with the same characters from "The Atrocity Archives." AA was originally serialized in a UK SF magazine, and was reprinted here; I am not sure, but I think it may have been expanded some for the novel version. For those of you who don't know him, Charles Stross has written, in my opinion, one of the best mythos stories ever, "A Colder War." This story is available to read free online on his website and also in his story collection Toast. I believe it will also appear in The Cthulhuian Singularity whenever that worthy collection sees the light of print. Now I am struggling to come up with comparisons here, the story is that good. It sort of fits in with Cody Goodfellow's Radiant Dawn, or even more, the Delta Green fiction, where the Lovecraftian truth of the universe is known by the governments of the nations and they try both desperately to conceal it from their citizens, and use this horrible knowledge as a weapon. The soviets have a handful of shoggoths and the means to free Cthulhu, and the US has access to some extradimensional gates. I find the story wildly original, marvelously written, absolutely true to Lovecraft and also carrying a perfect sense of horror. So it was with great anticipation that I turned to "The Atrocity Archives." First, I really enjoyed reading this book and can recommend it without hesitation. But I am having a very hard time deciding what the heck it is that I am recommending! I read the novel and novella before the introduction or the author's note, and came to a conclusion that although this work lives and breathes in Lovecraft's worlds it is not really a mythos novel at all, not the way "A Colder War" is. The author's note just confirmed my suspicions! Most interesting is that Stross had not read Tim Powers's Declare or any Delta Green before finishing AA, so it is entirely his own conception. Briefly, all the mythos entities etc are real, intelligent and malignant alien entities that exist in alternate universes (ah, the old multiverse concept! ), who may have access to our universe if the proper ritual is performed. It runs out that there is a scientific and mathematical basis for this ability to open gates, and it has been systematized, and this knowledge is a closely held governmental secret. All the occultism has now become much more mundane. I'll quote an example; "In the case of the great circuit of Al-Hazred, the terminator was originally a black goat, sacrificed at midnight with a silver knife touched only by virgins, but these days we just use a fifty microfarad capacitor." Being a computer geek helps you create/understand/master the mathematical circuits you need. Mundane, yes, but the danger to the summoner remains, particularly if you are trying to summon or manipulate a more intelligent alien entity. In fact the AA refers to the record of The Holocaust, where the Nazis tried to use an enormous blood sacrifice of millions to open the gates to supernatural aid that would have won the war for them (similar in concept, but greater in scale than DG's Karotechia). But nowadays everything is run by a labyrinthine, unnavigable and intractable civil service bureaucracy. And so this novel really is more a cloak and dagger spy novel, where the trappings are not so much James Bond gadgets as ancient geases, sacrificial gates and hands of glory as standard issue occult weapons. Honestly, there is no Lovecraftian feel at all! Anyone who seems to be stumbling onto the science or ritual necessary to manipulate reality this way is forcibly recruited by the government for national security reasons. The hero is Bob Howard, a hacker/computer geek turned field agent, who goes spook hunting to track down what seems to be the remnants of a cell devoted to the Nazi dream of opening a gate so the ice giants, some malignant entity can come through and finish the war properly for once and all. Someone a bit like Q (think Bond flicks, not Star Trek!) issues him some occult gear, he never goes anywhere without a laptop or palm pilot, he rooms with some computer geeks who are busy creating nameless gates in the basement apparently for the heck of it, he basically has a small cubicle to call his own and supervisors who are quite petty. All in all superbly written and great fun. He meets a British expatriate named Dominique who is of course strikingly pretty, a brilliant mathematician, a computer geek and who falls for him. Of all the characters she was the least successful, partly because in spite of all these qualities attributed to her she never rose above the level of window dressing, the damsel in distress who needed to be rescued. High tech, low tech, extradimensional tech, this book was a corking good read. But read it with mindset that it is a spy novel and you catch the flavor better. I liked the novella "The Concrete Jungle" equally well. 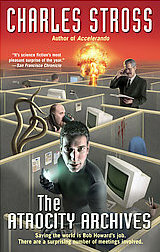 Mr. Stross continues Bob Howard's adventures in The Jennifer Morgue, due in November 2006. You may obtain this book in hardcover from Amazon.com. You may obtain this book in paperback from Amazon.com. LOST WORLDS OF SPACE AND TIME, VOLUME ONE, edited by Steve Lines. Cover by Steve Lines. Calne, Wiltshire, England: Rainfall Books, 2004. 205 pages. OOP. ISBN 0-9546178-7-8. Cover illustration © Steve Lines. 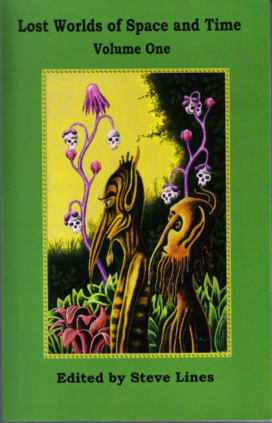 Lost Worlds of Space and Time edited by Steve Lines is newly published by Rainfall Books in the UK, and is a collection of almost all newly published works based on or inspired by the works of Clark Ashton Smith. Cover price is $16.99. I got mine from Shocklines with their usual free shipping. I have never seen it offered on Amazon, but then I think Rainfall Books only sells their chapbooks on ebay and Shocklines. It is a handsome trade paperback, I think with the typical feel and look of small press publications these days. The cover art and interior art is also by Steve Lines; at least the cover is based on works by Clark Ashton Smith. It is an interesting depiction of two aliens and some weird plant like things suspending human skulls. Attractive but no wow factor, although the longer I've lived with it, the more I like it. I enjoyed the interior art; it added to the overall quality of the book. There is a brief introduction by the editor and a few authors' notes after some of the stories. Otherwise there is no description of the authors', minibios or their thoughts about CAS. Page count is 205, so I thought it was a generous sampling of stories and poetry. I must commend Rainfall Books; they are a very enterprising small press. Check out all their chapbooks on Shocklines: they have publications devoted to mythos type tales, Yellow Sign fiction and to works inspired by CAS. I know purists would dispute this, but I always lump these three genres together, maybe because this is the weird fiction I like best! Stories are grouped together by the particular realm of CAS in which they are set or that inspired them. Right from the get go the editor acknowledges the one problem for this collection that cannot be surmounted. That is, all of these stories are written in the incomparable shadow of the prose of Clark Ashton Smith, an inimitable master. Anyone who tries to adopt his style can end up reading like a bad mimic. I have A Rendezvous in Averoigne, the hardback by Arkham House as my basic Smith collection. I urge all readers who have not done so to seek out this volume. It has a cherished place of pride on my bookshelf. Of course there is the upcoming Nightshade Books five-volume collection of all the weird fiction of CAS. If it is anything like their William Hope Hodgson collection, then it will have all of CAS' works edited in the context of the most up to date scholarship, in utterly beautiful leather bound editions. However the subscriber price for that is $150 and I just do not know if I can swing it. What the hell, I'll play the lottery tonight . . . Where was I? And Lost Worlds of Space and Time is not the first such CAS inspired anthology. There is The Last Continent, in a gorgeous hardcover edition by Shadowlands Press edited by John Pelan. It has stories set in Zothique. I had read two to three stories in that when I loaned it away; it is now next on my reading stack. OK, we just have to accept that no one is like Smith. And I am grateful for collections like this packed with brand new stories of weird and wonderful fiction. Overall I was favorably impressed with this book. Minor spoilers may follow. "The Empress Ygloriane" by Robin Reed -- Enjoyable tale of an empress who maintains her power and youth with noxious magics, and whose downfall is plotted by her servitors. Meanwhile a patient, unaware and indifferent sentience takes no notice of her comings and goings. "The Departure of Malygris" by Steve Lines and John B. Ford -- A strange and nicely creepy tale of how the ennui of an ancient sorcerer is finally overcome, not to the betterment of the surrounding city. Very engaging read. "The Fear of Liqoimkh" by Laurence J. Cornford -- Never underestimate a magician! A bold and scheming bandit overlooks one of the basic tenets of being an evil overlord and leaves his enemy alive to gloat at him. An engaging read. "The Pool Above Nraqlommbeth" by Simon Whitechapel -- Forlorn love story, with hope and love intermingled with death and despair. Another good read. "In the Court of the Crystal Flame" by James Ambuehl -- I have read this story before and this time I enjoyed it even more. It is a sequel of sorts to the well know story by CAS of Satampra Zeiros' adventures in the temple of Tsathoggua. If REH, Fritz Leiber or anyone else had created such a marvelous thief, they would never have just used him in one story. He simply cries out for his own series of tales. So James Ambuehl takes up the gauntlet. What really set this story into its proper context for me was the author's note, acknowledging the more appropriate antecedents of REH and sword and sorcery as opposed to CAS. Vivid and fun to read. "Star Spawn of Hyperborea" by John Fultz -- this owes as much to HPL as CAS, as a little band of adventurers tries to prevent Cthulhu from gaining freer access to our world. Perhaps the canvas is too broad or the story too long. Also owes more to REH than CAS. Still a decent read. "The Exorcism of Igsat" and "The Forgotten Ritual of Mnar" by Joseph S. Pulver Sr. -- I think these two were supposed to be like brief excerpts from the Book of Eibon. They did nothing for me. "Fire" by Randal D. Larson Excellent story! A sorcerer reaches into our time to find an ally. This whole section devoted to Averoigne stories was highly superior, moving from strength to strength, with great plotting and prose. I won't go into details, but all four of these were outstanding, and probably had the most CAS-like feel, particularly "The Passing of Belzevuthe" by Simon Whitechapel, although I also liked the Minnis stories. The Unknown Realms section was all poetry. I think writing poetry is terribly difficult. In school we are weaned on the best the English language has to offer. Thus I mostly don't enjoy mythos or weird poetry. Maybe someone else will like it. So in summary a terrific anthology. Reasonably priced, with good production values, I found it a great way to while away some hours lost in the worlds created by CAS, a true master. I heartily recommend it to all weird fiction readers. Best of all, it is volume one. You may obtain this book from Shocklines.